We are going on holiday to Center Parcs soon and I can't wait. 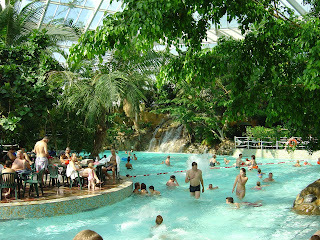 I love Center Parcs, even though in recent years it has become a bit pricey. I suppose more people are holidaying in the UK at the moment what with the Eurozone being a bit pricey for us at the moment, therefore demand must be higher for places like Center Parcs so up go their prices! Anyway we have managed to get a week at Elvedon in a super duper lodge for £419. Talk about sunshine indoors, it's perfect for small children and parents alike.